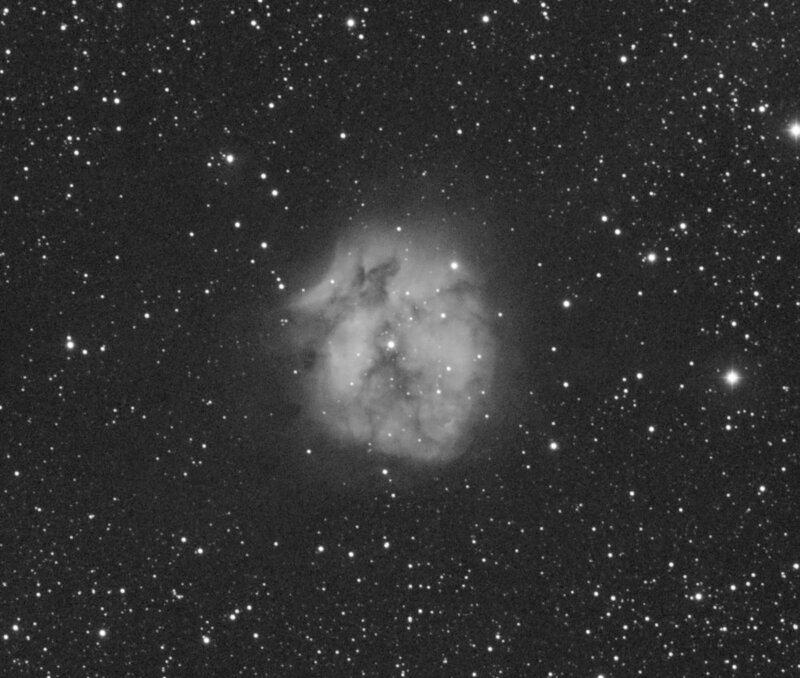 IC 5146 (also Caldwell 19, Sh 2-125, and the Cocoon Nebula) is a reflection/emission nebula in the constellation Cygnus. It is as a cluster of 9.5 mag stars involved in a bright and dark nebula. It is located near the star Pi Cygni, the open cluster NGC 7209, and the bright open cluster M39. The cluster is about 4,000 light yeas away, and the central star that lights it formed about 100,000 years ago, the nebula is about 12 arc minutes across, which is equivalent to a span of 15 light years. When viewing IC 5146, dark nebula Barnard 168 (B168) is an inseparable part of the experience, forming a dark lane that surrounds the cluster and projects westward forming the appearance of a trail behind the Cocoon. This Ha image taken on 09-20-2016 is a combination of 6x900 subs using a SVA130EDT scope a sBig stf8300m camera ans a astrodon HA 6nm filter. Captured with SGP and stacked in Maxim and processed in PI.